Should I buy IYB 19 if I’ve IYB 18? Which chapters are important for UPSC Prelims? How much time should I spend on ‘Yearbook /PIB stuff’? Q1: Whether to buy IYB 2019, If I’ve India 2018? Ans. After comparing the two editions, my answer is clearly “no”. They have updated a few chapters in a very superficial manner But that much material (on schemes / policies) you have already gathered from other PDF / Magazine compilations, so nothing is really gained by spending time and money into this. Observe the table given below. No. name Any changes in 2019 edition over 2018’s edition? 1 Land And The People No change N.A. Since 2018 they removed census tables at the end of this chapter, so now you should prepare it from other web sources / Majid Hussain’s Geography of India. 2 National Symbols No change N.A. Although I do not say this with negative tone after all this chapter is static in nature. 3 Polity No change N.A. It has certain information which is not given in Laxmikanth so one has to prepare e.g. Civil Services Day, Ministries and departments etc. Some data changes in page number 50, 51 ,52, 53, 54,55 and there are some additional information added in page number 52 and 53. But filler material / data nothing really exam worthy gained from here. 5 Culture And Tourism No change N.A. 6 Basic Economic Data Yes There is changes in page number 88 and 89 Members of Parliament Local Area Development Scheme norms, but search that from PIB and you’re done. 7 Commerce Yes There are some additional information at page number 90 and 91. But filler material / data nothing really exam worthy gained from here. 8 Communication Information Technology No change N.A.Inko sharam bhi nhi aati. 9 Defence Yes Changes at introduction part page 124 and 125- added some info about military exercises. New bolbachchan about Make in India, Digital India and women empowerment in page 128 and 129. 10 Education No change N.A. Inko sharam bhi nhi aati, ki atleast namesake few paragraphs could be updated. 11 Energy Yes Some information about Power at page number 172 and some headings like development of national grid. Mantri ujjwala yojana, pahal at 174 and 175- but those schemes you should have already prepared from elsewhere. 12 Environment No change N.A.Inko sharam bhi nhi aati. 13 Finance No change N.A.Inko sharam bhi nhi aati. 14 Corporate Affairs Yes Only minor additions at introductory part at page no. 249. Yes Only minor additions at page number 259. 16 Health And Family Welfare No change N.A.Inko sharam bhi nhi aati. 17 Housing And Urban Affairs No change N.A.Inko sharam bhi nhi aati. 18 India And The Word Yes While there are many headings and new data has been added in whole chapter but mostly bolbacchan in nature. There are better (& Free) compilations available for annual summits / treaties / agreements. New corridors has been added at page no 334. Pradhan Mantri Khanij Kshetra Kalyan Yojana added at page number 360 but that much you should have already prepared from other PDF / Magazines. 20 Law And Justice No change N.A.Inko sharam bhi nhi aati. 21 Labour Skill Development And Employment Yes There are some changes at page number 406 and 407. Labour inspection scheme, some new filler headings added at page number 408. Udan scheme added at his number 416. 22 Mass Communication No change N.A.Inko sharam bhi nhi aati. 23 Planning Yes Economic Advisory council to prime minister at 453 and some filler data at 460. 24 Rural Development No change N.A.Inko sharam bhi nhi aati. And the edition that i received even has faded print quality in this chapter, it’s difficult to read. 25 Scientific And Technological Development Yes Science technology and innovation policy at page number 477 health safety environment has been added in page 483- but nothing in exam worthy format. 26 Transport Yes Bharatmala pariyojana added at page number 502. Sagarmala programme added at page number 505. but that much you should have already prepared from other PDF / Magazines. 27 Water Resources Yes There are some changes at heading water availability at page no. 517. Minor irrigation and water body census added at page number 534.but nothing in exam worthy format. 28 Welfare No change N.A.Inko sharam bhi nhi aati. 29 Youth Affairs And Sports No change N.A.Inko sharam bhi nhi aati. 30 State And The Union Territories No change N.A.Inko sharam bhi nhi aati. 31 Diary of National Events Yes They added current affairs from 2018-Jan to December. But that is in Bullet point heading only. You would have already prepared them in detail through various PDF / Magazines. Conclusion? From above table, it is evident that if you have India 2018, then no need to buy India 2019. 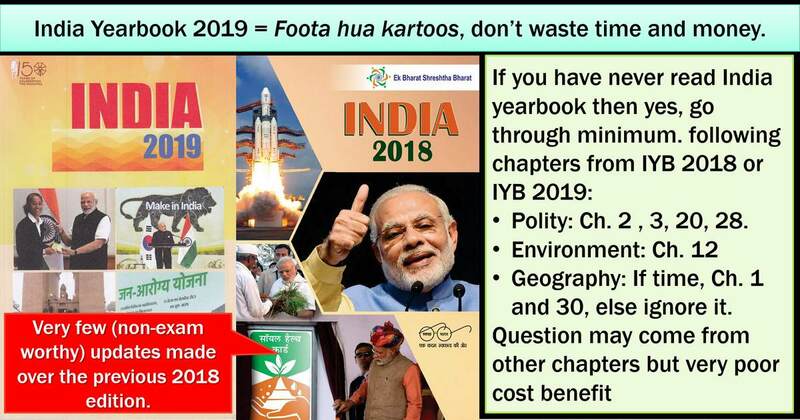 Q3: Which chapter(s) are important to read from IYB 2018 or IYB 2019? Polity: Ch 2 , 3, 20, 28. Geography: If time, ch. 1 and 30, else ignore it. While question may come from other chapters but it will give very poor cost benefit, given that less than 60 days are left before prelims. Q4: How much time should I be spending in preparation of IYB / PIB type topics? In the preCSAT (2011) era, they used to command good size ~10-12 MCQs or even more directly coming from Yearbooks of those years. Nowadays too question are coming but in the depth that is beyond the stuff given in IYB. e.g. random bodies / random summits like Asia Pacific Ministerial Conference on Housing and Urban Development (APMCHUD) and FSSAI norms. It gives a rather poor cost to benefit in pursuing it beyond a point. So if something is better to simply skip it or engage in 50:50 / guessmastergiriTM / tickmastergiriTM. Similarly, randomly launched apps, portals, initiatives, missions with contrived abbreviations what is the utility? Perhaps 2-3 MCQs, but, you should not be spending 97% of your time chasing that 3%. “I will do what no one else is doing so I will become super genius by ticking 3 more MCQs!!! !”…… Arre Bhai, that much time is better spent in other traditional areas of the General Studies. Cutoff is never 200 out of 200 marks. You can go through the topic wise question paper article series at https://mrunal.org/prelims#CSP18 to get a better idea about the nature and depth of questions asked in actual UPSC Prelims. 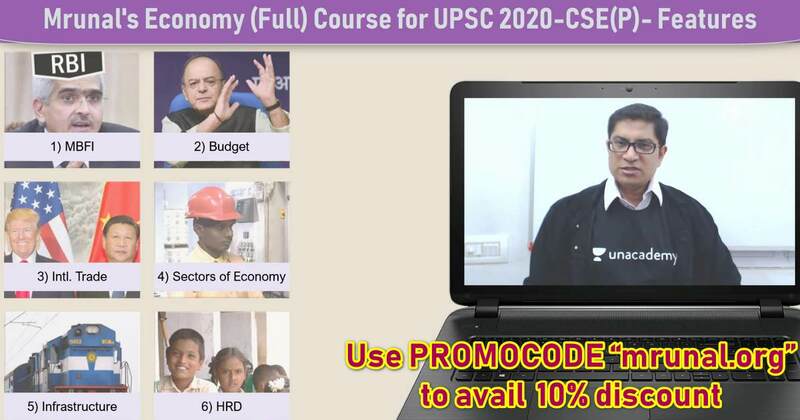 Further, I’m also pleased to announce that my full course on Economy for next year’s UPSC Prelims 2020 is starting from June 2019 onwards, with weekly live classes, rapid revision notes, regular quiz & doubt solutions. You can learn more about it on unacademy.com/plus and Use PROMOCODE “mrunal.org” to avail further 10% discount..
I’ve completed my Bcom and also have Post graduate diploma degree in Investment and financial analysis from Gujarat University. Am I eligible to give UGC NET exam? I want to give the same only as a backup option for civil services examination.